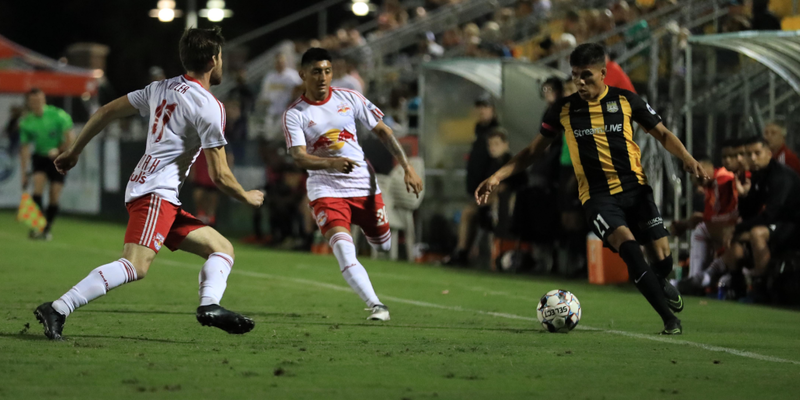 Tom Barlow’s first-half goal lifted New York Red Bulls II to a 1-0 win over the Charleston Battery in the Eastern Conference Quarterfinals Saturday night at MUSC Health Stadium. New York scored in the 21st minute after a back-and-forth opening to the match. Amando Moreno received the ball out wide on the right flank and played a cross-field pass to Barlow. The 6-3 striker took a touch to create space and curled a shot towards the back post and out of Joe Kuzminsky’s reach to put the visitors ahead in the early going. The Battery nearly equalized minutes later from a set piece. Gordon Wild curled in a free kick from the right side, but his service was just out of the reach of a sliding Skylar Thomas at the back post. The hosts had another opportunity to equalize just before halftime when Nico Rittmeyer sprung a counter attack down the middle of the field. Rittmeyer dribbled towards New York’s goal, drawing two defenders to him before laying a pass off to Wild, but the German forward dragged his left-footed shot wide and the Battery went into the locker room down a goal. New York came out of the halftime break on the front foot, leading to Jared Stroud ringing a shot off the crossbar in the 52nd minute. Following Stroud’s near miss, the Battery controlled the game and pressed forward in search of an equalizer. Charleston had two chances to send the game to extra time in second-half stoppage time. The first fell to Ataulla Guerra, but he got tripped up inside the penalty area and couldn’t turn a shot on goal. Moments later, Tah Brian Anunga whipped a cross in from the right flank. Ian Svantesson rose up and met Anunga’s serve, but his header fell into the welcoming hands of goalkeeper Evan Louro and the referee whistled for full time. The loss eliminates the Battery from the playoffs. New York will advance to take on FC Cincinnati at Nippert Stadium next week.